Apologies for the delay posting. Work interferes somewhat with things like that, but here I am, blogging again. We’ve moved into the house in Korumburra. Korumburra is a small, sleepy town in South Gippsland. It is quite pretty, especially the hills around the town. The street we live on is lined with deciduous trees, and they’re beginning to lose their leaves for the winter. We’ve been quite active houseowners, and have been gardening, painting, putting up fences, cleaning walls (inside and out), cleaning gutters – the list goes on. It’s a good place to live. The local church is also quiet. It is a beautiful church – very much in the gothic revival tradition of architecture. At the moment there isn’t a parish priest – the last one retired in September and a new one hasn’t yet been appointed. That’s a bit sad. There are three retired priests who are ministering as locums, but the community is showing the signs of being without a leader. Work is good. I’m surprised that I’ve been here for three months now. It seems to be progressing well. I get tired easily, but I seem to be coping with it OK. I’m beginning to understand the industry, and see where the various bits and pieces, acronyms and abbreviations all fit in. Doctor Who has begun again in the UK. I haven’t seen the first two episodes, but I’m looking forward to them. I’ll be interested to see how Catherine Tate goes as Donna when there is a sustained role to play. Biff the Dog and Molly the Dog are well. It is fascinating to see how their personalities have changed since we moved. They seem much more balanced and relaxed. Perhaps that’s just because the routine at home is much more settled now. Tomorrow I’m going to the Australian Christian Meditation Community’s National Forum, which is being held in Melbourne. Fr Laurence Freeman will be there, as will a lot of other people! I’ll be making my life profession tomorrow afternoon. Health is OK. I spent yesterday at Peter Mac having intravenous immunoglobulins, rituxamab, and a unit of blood. I have a slew of minor complaints – sinusitis (a course of antibiotics and treatment for allergic rhinitis), diarrhoea (a referral to a gastroenterologist), a fungal patch on my leg (some topical antifungal lotion) and weight loss. Mysteriously, or semi-mysteriously, I’ve lost 5kg in about 3 weeks. That’s certainly partly because I’m doing more incidental exercise and eating better. We’ll see if it continues. John Main was a Benedictine monk who, guided by the Holy Spirit, offered the church the rediscovered and ancient treasure of Christian meditation. He died 25 years ago, but the community he left, the World Community for Christian Meditation, is today a vibrant expression of springtime in the church. There was a memorial Eucharist held in Westminster Cathedral on 29 December 2007. At it, Dom Laurence Freeman, the current spiritual teacher, delivered a homily which you can find here. … [John Main] understood prophetically the needs and the crisis of modern Christianity – how it needs to sink back into its contemplative roots in order to branch outwards to a world – a world changing so rapidly that even the speed of change has already dislocated and uprooted several generations from their culture and their faith. He was a man of the tradition but understood tradition in terms of roots and so he was a radical, indeed in his way, a revolutionary religious figure of our time. He read the signs of the times – as a son of the great Council – and saw that the old forms and structures need to be courageously re-visioned and adjusted to the spirituality of the new phase of history we have entered. For him – as for the monks of the Christian Desert he had learned from – this meant rediscovering the power of prayer as a way of personal, interior transformation. It meant seeing that all prayer leads to contemplation which is the ultimate goal of human life. When the early church confronted the institutions of the pagan world it found it could not convert them. If you pulled down one temple, smashed the statues and killed the priests another temple would be built in another sacred wood and the old rites would be restarted. So – pragmatically and perhaps inevitably – the church changed its policy. Convert the temples into churches, re-hire and retrain the priests, make the old gods into new saints. Merge rather than compete. Thus the rich and wonderful era of Christendom began. But we who live at the end of Christendom may well ask how deep did the actual conversion process go. How well did the seed of the Word actually sink into the soil of the western mind? How is it that this great tradition was so vulnerable to new ideas, to science and technology, so resistant to democracy, individuality and modernity and eventually so helpless in the face of consumerism? Adapt yourselves no longer to the pattern of this present world but let your minds be remade and your whole nature thus transformed. This cheerful fellow is Bodhidharma, who is credited with bringing the Buddha-dharma to China. After a few busy days I’m at home alone, with a sore mouth (dental work from Tuesday), pondering things. No special pondering, just thinking about life, the universe and everything. I wanted to write about how much of a blessing my partnership with Peter is. I derive such comfort, togetherness, challenge, love and support from it. It is no exaggeration to say that without him, and without the love and support of my parents and a few others, I would be in a deep dark place today, I suspect. I sometimes fear that I give Peter less than he needs. He is good at emotional expression, I’m not, though I think I have learned to be better. One of the things about relationship, I’ve found, is that it knocks the rough edges off if you let it. That can be a painful process, but it is ultimately vital to growth as a person. The other thing is that in Peter’s love for me, acceptance and forgiveness, I see the love, acceptance and forgiveness of God, very powerfully. All of this makes me wonder about the rightness of a position, intellectual, theological, moral, ethical or otherwise, that says that our relationship is wrong. Isn’t this how they should be? During this time of my illness, especially, my parents have been rocks of support. Picking up the pieces when no-one else could or would, and making a thousand things, little or big, easier or even possible. They are beautiful, loving and giving people. Peter’s mum, too, has been a source of great strength, telephoning and checking how I am when Peter is away, sending helpful little somethings, listening and encouraging. I wanted to write, too, about the torment in the Anglican Communion. The battle lines are clearly drawn, and it seems to me, from what I read (though it must be noted that although I read stuff from both sides of the debate, it is hard to find a neutral but informed position), that some sort of realignment within the Communion is likely. I don’t know what effect that will have on Australia. I guess it will remain to be seen. What is terribly disappointing is the lack, I feel, of loving care for one another in the debate. Christendom is not good at sorting these things out, and has a nasty history of doing great violence and damage to those who disagree. Peter starts his new job on Monday – I really hope he likes it and finds it fulfilling. He deserves that. The great fictional consulting detective, Sherlock Holmes, is a boyhood hero of mine. I first picked one of Conan Doyle’s novels up, The Hound of the Baskervilles, when I was about eight. I was entranced by this other world of fog, criminals, loyal companions, and Sherlock Holmes. The Hound of the Baskervilles is unusual in a way, because Holmes is absent from the story for much of the narrative. Like nearly all of the stories in (what aficionados call) the canon, the story is narrated by John Watson, Holmes’s faithful friend and indispensable assistant. Most of the stories in the canon are shorter, but there are a few extended narratives (A Study in Scarlet, The Sign of the Four, Hound of the Baskervilles, The Valley of Fear) which I think are, in general, probably superior stories. Sherlock Holmes has many admirable qualities, but Conan Doyle crafts a hero with dark shadows to deal with. Holmes is keenly intelligent, but needs constant stimulation or he falls into deep depressions and drug abuse. He is a gentleman, but is arrogant and dismissive of those who fail to understand his ‘method’ and it’s value. He has great insight into all around him, but little insight into himself. He is a loner who consistently reaches out to his friend, perhaps his only one, Dr John Watson. The Holmes stories provide a window into another world, in some ways so similar to ours, in others vastly different. The differences are, perhaps, most noticeable in the areas of values, morals and ethics, but exist on much more mundane levels too. I think, though, that Sherlock Holmes remains an enduring favourite because the stories are such good yarns, and reading them now takes me back to a childhood when opening a book could plunge you into a new world. Because of the odd way that history was taught during my primary and secondary school careers, the first I ever heard of Mahatma Gandhi was the 1982 film. I was in year 8, and my mother decided that she would buy tickets and take us to the cinema to see the film. I remember it very clearly, and remember the impact both the film and the man had on me. I don’t think I had a particularly protected upbringing, but I was unaware that there was such injustice in the world, and that it was possible for people to be discriminated against purely on the basis of who they were – the colour of their skin. The notion that a system of racist and classist institutions could perpetuate and protect discrimination was very confronting too. I was also struck by the power of Gandhi’s philosophy of non-violence and non-resistance. If I’m truthful, it was also the first time I was hit by the notion that the culture I come from was violent, and not superior to others. Gandhi is a hero for me because he strove to live truly, honestly, simply, and tried to make a difference by virtue of his convictions. He lived as he believed, and the integrity of his life shone out. As a real person, with appetites, aches, pains, desires, hopes and aspirations, he speaks to me and provides me with the example of a brother who has trodden the way. Would that I could live with the same integrity. When I was thinking what I might write about on this site, I came upon the idea of writing about people (real or fictional) who have been particular heroes of mine. There are, I guess, formative figures for everyone who model something – a behaviour, attitude, a dimension of life, an ability, a way of being, whatever. They inspire and lead us beyond ourselves, hopefully prompting us to grow and change. My first hero, then, is one of the oldest in my life. I am one of those sad people (not so sad anymore, actually, with the rebirth of Doctor Who) who has been influenced in many ways by the lead character of the BBC television series, Doctor Who. He is a man known only as the Doctor. 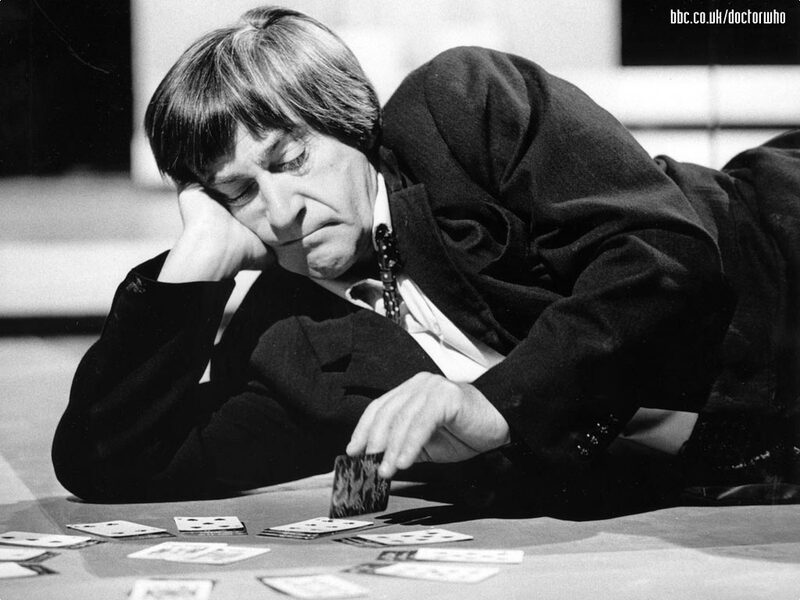 We know some things about him – he is a Time Lord, he is very old (though his age is variously stated through the more than 40 years of the show), he travels through time and space in his vessel, the TARDIS, and he usually travels with a companion. Which brings me to the hero element of the Doctor. Though his face and personality changes throughout the show, some things remain consistent. The Doctor is implacably opposed to evil, tyranny and stands up for the rights of those oppressed – even when the cost to himself is high. The Doctor places a high value on life and freedom. He is open to new ideas and willing to explore new possibilities. He rejects violence and refuses to use it himself, or countenance its use by others. The Doctor feels deeply. He is self-sacrificing. He is also playful, generous and open to others. Those attributes, coupled with the sorts of stories told on Doctor Who (particularly of late), mean I have never ‘grown out of’ the Doctor. Doctor Who is the first TV show I remember watching, and is the one I always turn to when I need a lift.